The Mountain West is certainly starting to get interesting these last few weeks, not on the West side of the division, but definitely on the Mountain side. It’s starting to look like we’re going to see a Boise vs Fresno rematch in the Mountain West championship game, pretty much the matchup we all saw coming in the preseason, though, I don’t know if we imagined seeing Boise struggle so much so early in the season. One thing that’s become pretty apparent is that Fresno is not going to get any respect in the BCS standings, but if they keep winning football games it’s hard to imagine that they’d be left out of the BCS bowl picture. Fresno dropped a spot in the standings this week, the bye week did them no favors. Getting the week started was Colorado State visiting New Mexico. The Lobos are one of the premier rushing attacks in the country this year, but little did they know they would not lead this game in rushing. The Lobos ran into a buzzsaw known as Kapri Bibbs. The guy has been on a tear the last few weeks of this season rushing for more yards than a few teams have for the season. This game was a classic WAC matchup and the track meet was engaged pretty early in this game. Bibbs ripped off 291 yards and six touchdowns. SIX FREAKING TOUCHDOWNS. Garrett Grayson wanted in on the fun too, he threw for 302 yards and three scores. Cole Gautsche, who apparently wears a helmet too small for his head, had a nice game, throwing for 133 and two TDs and 2 INTs, also rushing for 60 yards. Clayton Mitchem came in late in the game to try to throw the Lobos back into it but couldn’t quite do it. The Rams stifled the Lobo rushing attack (compared to how they normally rush), and held Kasey Carrier to 13 yards rushing on six attempts. This one ended in a 66-42 shootout. The Rams will face off with Utah State in Logan next, New Mexico will be at Fresno State. You guys have no idea how hard it is for me to type “Rams” instead of “sheep.” Carrying on…. Wyoming continued their downward spiral and further abuse on my liver as they headed off to Boise to take on the Broncos on their blue turf and rake in more than of that sweet sweet Mountain West TV money. I honestly don’t know how much more Fireball and Jagermeister my liver is going to handle this year, but Dave Christensen is certainly testing those limits! The Cowboys got off to a quick 7-0 lead on a Brett Smith to Robert Herron touchdown, but that was the last time the Cowboys would see the endzone. Boise State ripped off 48 straight points en route to a 48-7 victory. Grant Hedrick threw for 265 yards and three scores. The Boise rushing attack rushed for 241 yards while holding the Pokes to 55 yards. The Broncos continued doing what they do best.. just rolling along. At this point it’s hard to imagine the Broncos won’t be going to Fresno for a rematch in the Mountain West title game. Wyoming will host Hawaii next week, Boise State will be at San Diego State. Are the Hawaii Rainbow Warriors starting to turn things around a little bit, or were they just super inspired wearing some throwback Rainbow Warrior uniforms? Hard to tell, but they took a pretty good football team to overtime. San Diego State was fighting to get bowl eligible in this one and got a much tougher matchup than they had anticipated. San Diego State had to claw back into this game with a touchdown from Chad Young with 2:34 left in the game to send it to overtime. When they got to overtime Adam Muema did Adam Muema things and that was run wild. He rushed for 163 yards and a score. The lone score he had was the game winner in overtime. Quinn Kaehler had a nice game, throwing for 265 and a score, but only completed half of his passes. Sean Schroeder, who appears to have the starting job after 11 weeks of football also completed 50 percent of his passes, throwing for 194 yards and two scores. Joey Iosefa rushed for 150 yards and a score for the ‘Bows. In the end, Hawaii is still winless, but at least they have a quarterback.. until Norm Chow starts twitching again. San Diego State will host Boise State next week, Hawaii will make a chilly trip to Laramie next week. In the nightcap this week Nevada hosted San Jose State. 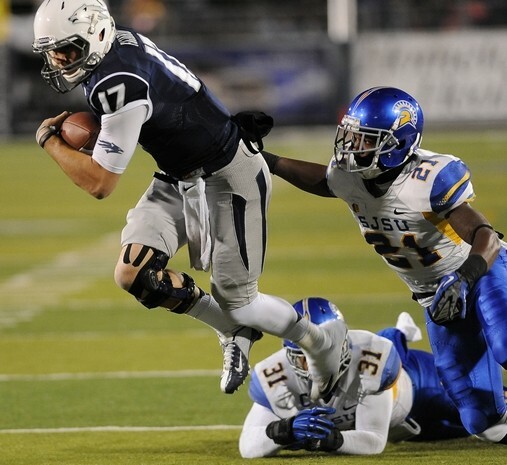 San Jose State was looking to get bowl eligible while Nevada is looking to play spoiler. Nevada quarterback Cody Fajardo lost his damn mind and decided to take things into his own hands. Fajardo threw for 171 yards and a score, while rushing for 104 yards and a score. The Wolf Pack (two words) also got a good amount of rushing from Kendall Brock and Don Jackson. On the other side of the ball David Fales did all he could to get the Spartans in this game, but ultimately they were shut out for the 2nd half of the game. Fales threw for 326 yards and a score. The Wolf Pack held down the Spartan rushing attack to 58 yards after getting good performances from walk-on Jarrod Lawson. San Jose State will try to get bowl eligible against Navy next week, Nevada will have a bye. The Mountain West undoubtedly has some special players in the conference. Kapri Bibbs is starting to get a lot of attention with his weekly rushing stats. If memory serves correct I believe this is two weeks in a row he has led FBS in rushing. His stats are just eye popping. Nevada got to see the Cody Fajardo they wish they had all season, taking hold of the offense and dominating on the field. I wouldn’t say he out-dueled David Fales, but his team got the victory. Wyoming’s defense continues to be a dumpster fire, nothing they seem to try is working. Lack of depth? Probably, and that falls on the head coach’s shoulders. Next week we have a full slate of games, starting with UNLV at Air Force on Thursday night. You can catch that game on ESPNU. Friday night San Jose State will get some of that sweet Mountain West TV money as they host Navy on ESPN2.. talk about a contrast in offenses. For the rest of the slate we’ll have Hawaii getting ready to freeze their arses off in Laramie. Colorado State and Utah State should be a very entertaining game. Both teams are now bowl eligible, and with a Colorado State victory that pretty much sends Boise to the title game. Derek (not David) Carr should dominate New Mexico. Another interesting game, and the night cap this week, is Boise at San Diego State. Boise should win this one convincingly, don’t count out SDSU. A fine football team with a great running back. Should be a week of football and we’re gonna be up late watching!